Posted Thursday, May 24th, 2012 by Robyn Warner. The CPU (Central Processing Unit) is one of the most important components in any piece of major office equipment. While many people are aware of the role a CPU or processor plays in a computer, few may realize that a CPU is a very important component in most printers and multifunction devices as well. The CPU itself is generally a single chip connected to the machine’s motherboard. It is usually measured in terms of GHz or Gigahertz, which is a broad indication of its processing speed. There is significant debate about the accuracy of measuring a CPU in Gigahertz, as other factors like the number of cores (processing units) can have a larger impact on performance. As a general benchmark, however, this rating provides a decent point of comparison. 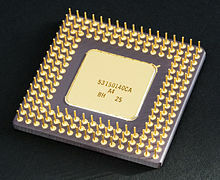 As the so-called ‘brain’ of a computer or printer, the CPU handles the input and output processing, which can include logic and mathematical calculations. In the case of a printer, the CPU receives and processes the commands coming from the computer or control panel, and tells the different components of the machine how to carry out the commands. In this way, it acts as the central control unit for mechanical operations as well. The processor also plays an important role in control panel functions, especially as control panels begin to look and act more like computers. Modern printers with full-color LCD screens, and even touch-screen displays, rely on the CPU to run the unit’s internal operating system or firmware, process a user’s interaction with the control panel, and turn it into printer operations. The CPU is also essential for networking functions. As printers and other devices are required to support large numbers of users on a wired ethernet network or a wireless network, the unit needs a way to process the different incoming tasks, prioritize and organize them, and carry them out in a consistent manner. The processor provides the logical and mathematical calculations to accomplish this. All of the pieces that make up the puzzle of printing technology are complex and each component is important. The CPU plays a central role in almost every operation that a printer can handle, and as these devices become more complex, it becomes even more essential.